Lovers of the Windy City, rejoice! One of Chicago’s most beloved dishes is Here. And man, oh man, is this easy Chicken Vesuvio good. It is hearty, garlicky, and classically Chicago. Even if you don’t have any connection to the dish’s Chicago roots, everyone can enjoy this family-style Italian comfort food. 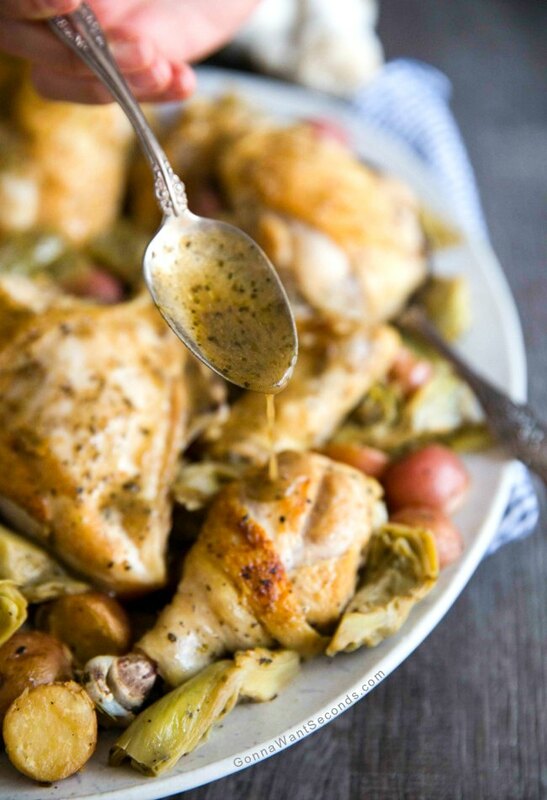 If you haven’t try Chicken Vesuvio, you’re in for a treat. This easy and inexpensive meal is a perfect addition to your weeknight meal rotation. I make it at least once a month because the recipe calls for one pot, and ingredients I already have in my cupboard. Plus, it’s very easy to double, which makes it perfect for serving a large family on a regular basis. The final dish has meat, sides, and veggies all wrapped into one. Could a family meal get any easier? Most locals have their own favorite chicken vesuvio Chicago restaurant. But this recipe is so moist and flavorful – dare I say as good any restaurant. And of course, the best part about making it at home – you can sop up all that delicious butter, herb, and wine sauce from your plate (which you definitely shouldn’t try at a nice restaurant, BTW)! This recipe makes a lot of that pan sauce, so there is plenty to spoon lavishly over your chicken and potatoes. Lots of people prefer a boneless chicken vesuvio recipe. And while that’s obviously perfectly fine, I prefer a whole chicken. I think you get more “bang-for-your-buck” with it, plus all of the different parts of the chicken work well in this recipe – not to mention the flavor you get from the bones. If you’re set on making an Italian comfort food recipe that uses boneless chicken breasts, I suggest you try making my Chicken Florentine Recipe. It’s really a stand out recipe and because of the chickens cheesy coating and rich creamy sauce, the boneless chicken breast works perfectly. This is a great recipe for a dinner party with your friends. Its rustic flavor will impress your guests – just serve with a side salad or rolls and everyone will think you’re some fancy Italian chef. The secret of how easy this recipe is to make can stay with you! 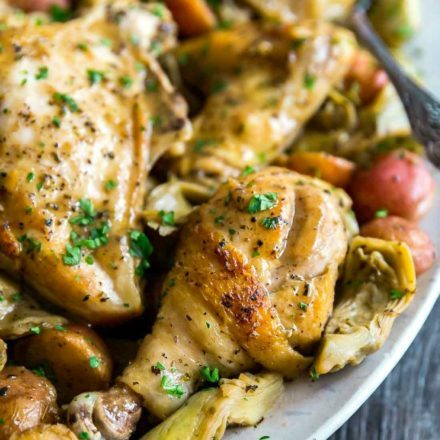 Making chicken vesuvio recipe slow cooker style might suit your needs best.. After all, lots of chicken-and-potatoes recipes call for a slow cooker. But I prefer the stovetop and pot version. Getting a nice brown on your chicken and your potatoes will add a lot of flavor and texture to the final dish. And those pan juices are absolutely essential to the sauce! Honestly, you just can’t get those flavors out of a slow cooker. Let’s talk potatoes! My recipe calls for red-skinned potatoes, cut in half. I think the smaller size and deeper flavors offered by red potatoes are ideal to compliment the chicken. 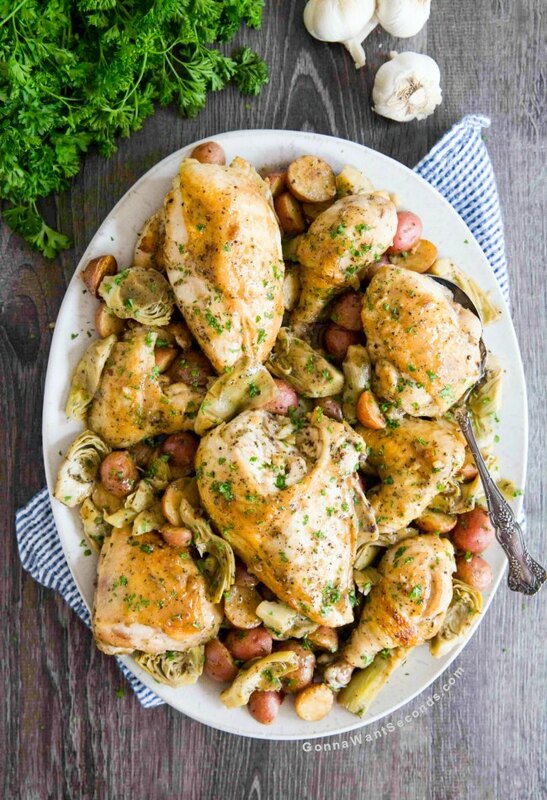 But when making her chicken vesuvio Rachael Ray uses large Idaho or russet potatoes. Really, any potato will do – the great flavors in the sauce are the main attraction anyway. I like red potatoes, and I think they are much easier to work with. The less chopping required, the better! But feel free to use whatever potatoes you prefer. Just make sure they get a good brown for a fantastic texture. You might even consider crisping the potatoes separately in the oven like I make in my Chicken Scarpariello recipe if you prefer a really crispy potato. Working with one pot is all about timing. You want to make sure each ingredient gets enough time to add its full contribution to the final flavor, without providing enough time for them to burn. For example, if your pot is running really, really hot you may need to add the white wine in immediately after putting the garlic in to avoid burning your garlic. It’s best to wait long enough to give the garlic time to sear nicely, but you don’t want it to burn. So, you’ll need to use your own best judgment. The artichoke hearts I use in this recipe are pretty standard and are a great addition to the dish’s overall flavor profile. I use frozen artichoke hearts to cut down on prep time, but if you want to use fresh artichoke that will work just fine. It’s just not as easy. 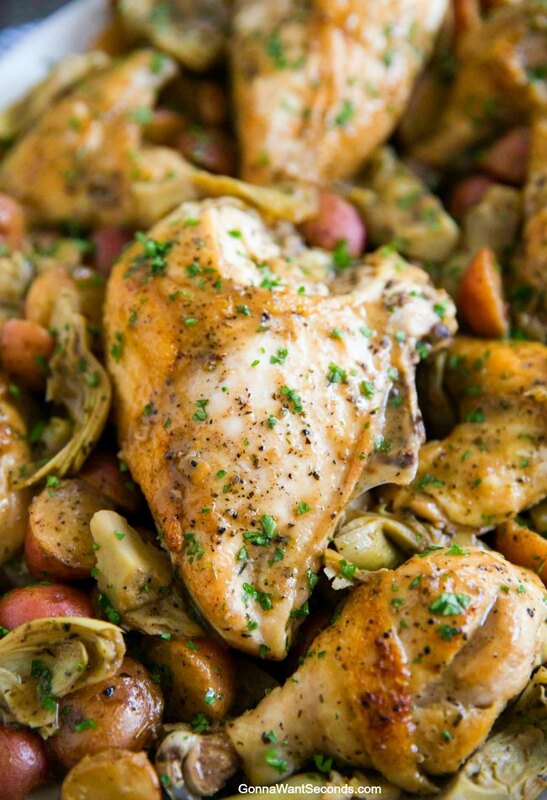 For her chicken vesuvio Giada prefers lima beans instead of artichokes. If you’re a lima beans fan, you’re a happy camper! Snap peas or sweet pea pods also work well. I think a regular Italian seasoning blend is perfect for this dish, and then you don’t have to get into a complicated decision-making process about spices: “How much oregano?” “Will this much thyme overpower everything?” It’s way easier to use a premixed Italian blend. But if you have fresh herbs from your garden, this is also a great recipe for those! Because let’s face it, fresh herbs and spices from the garden are hard to beat. I am a firm believer that you can never have enough chicken recipes. This delicious and easy chicken vesuvio is a great part of that arsenal. Salt – Anytime you’re cooking with chicken broth, it’s important to keep in mind how much salt you add to season the meat. Chicken broth has a ton of salt already in it, so be careful that you don’t over salt the whole dish when you salt the chicken. The other side is, of course, that you really don’t want to under season the chicken and make it bland. Look for that perfect middle ground where you get flavorful chicken and a sauce that isn’t bursting with too much salt. 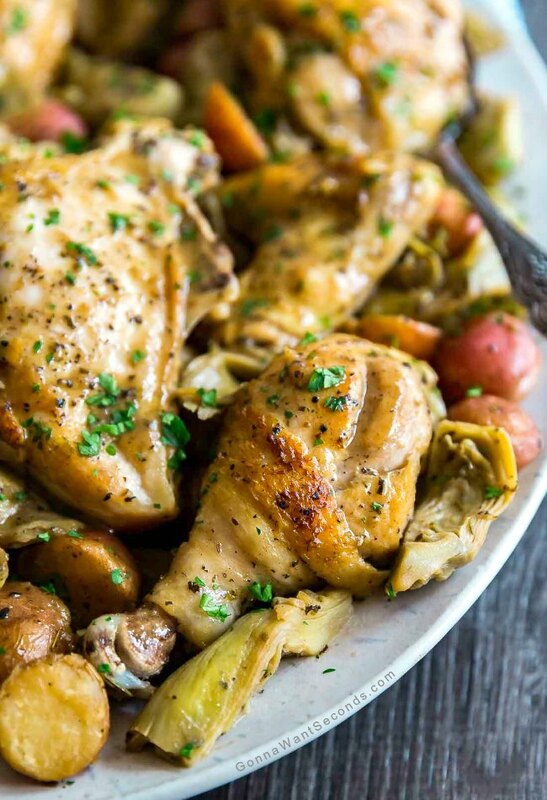 Potatoes – It is a rare dish that can highlight potatoes as well as this chicken vesuvio can. I always think that seasoning the potatoes just like you season the chicken is a good idea. You definitely don’t need the same volume of seasoning as you use on the chicken, because the potatoes will soak up a lot of flavor from the sauce. Make Ahead – If you’re aiming to make this dish ahead of time, you can brown the chicken and potatoes/veggies beforehand and store them in the fridge. Then, when it’s time to cook, just warm them up in your pot and continue the recipe as directed. Wine – The recipe lists a “dry wine” for part of the sauce. I cannot stress this enough: Don’t ignore that instruction. Not using a dry enough wine will make your final dish bland and flavorless. The wine is crucial to the final flavor. The drier, the better! Lay the chicken pieces out on paper towels, and dry. Generously season pieces with salt and pepper. In an ovenproof pot, heat the oil over high heat. When the oil is hot, brown the chicken pieces in batches, in a single layer, until golden brown on all sides, about 10 minutes. Remove the browned chicken pieces to a bowl. Brown the potatoes in the same pot, turning occasionally, until golden brown, about 10 minutes.Remove the potatoes to the bowl with the chicken. Add the garlic and red pepper flake and saute for 1 minute. Add the wine and stir, scraping up all the brown bits from the bottom of the pot. Add the broth, Italian seasoning, 1 teaspoon salt and 1/2 teaspoon black pepper. Return the chicken and potatoes back to the pot and stir to combine. Bring to a boil over medium-high heat. Cover with a tight-fitting lid and bake in preheated oven until chicken is cooked through 20-25 minutes. Transfer chicken and potatoes to a platter, arranging decoratively. Add artichoke heart to the pot and cover and simmer over high heat, until they're tender about 4 minutes. Reduce heat to low and add butter to the sauce. Adjust seasoning. Pour sauce over chicken and potatoes, sprinkle with parsley and serve. Mongolian Chicken Recipe – Light crispy chicken coated in a sweet-savory sauce! What temp for the preheated oven?